How Does Silvermont Compare To A15? 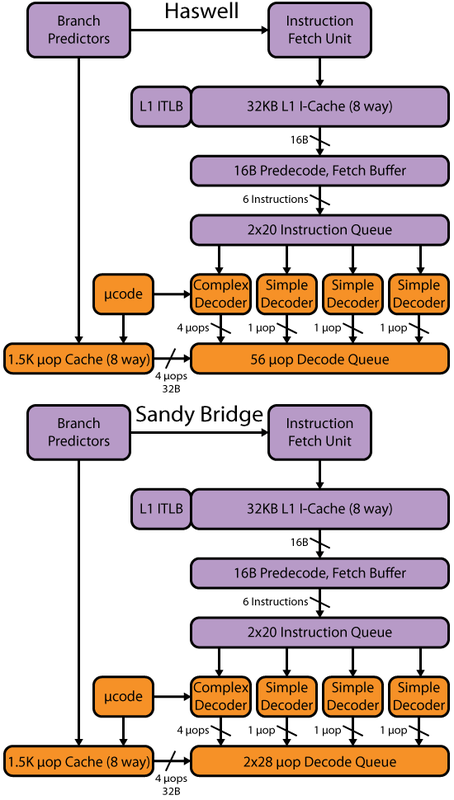 > a proxy for NDK performance, I would argue for SPECcpu2K. Or actual NDK apps. I wouldn't argue using SPEC if it's Intel providing the scores. VIA's independent findings are that whatever latest at the time ICC scored something like 20-30% better than GCC with Atom and Nano (AFAIK 4.6.x, so still relevant vs NDK). I don't know how much this is due to having an all around better compiler or Intel focusing optimizations for SPEC more than GCC does, but that isn't really important. What's important is that no one (outside of Intel, again) would consider using ICC on Android. And since Intel and nVidia are using SPEC2k for this they don't even report the test results properly. I remember you said you'd ask for these last time Intel gave numbers with Clovertrail, I take it you didn't get anything. > Sorry, I meant Medfield. And yes, I wouldn't ever expect comparable single threaded performance. > Moorestown is comparable or better than A9-based designs and sometimes can match A15. Did you mean Medfield here too? Bear in mind that Medfield is strictly 1C/2T and the only Cortex-A15 SoCs out are 2C or 4C. So there's no way Medfield can win in multithreaded only unless there's some frequency limiting on multiple cores, which shouldn't apply to either Exynos 5 SoC. Maybe you meant Clovertrail or Clovertrail+. But you'll also probably agree that embarrassingly-threaded tests are over-represented in mobile benchmarks.